Bring Sparkle to Your Ear with a 14K Gold Diamond Ear Cuff by Juliette Collection! Perfect for pierced or non-pierced ears, this clip-on ear cuff can be easily adjusted for a secure and comfortable fit. 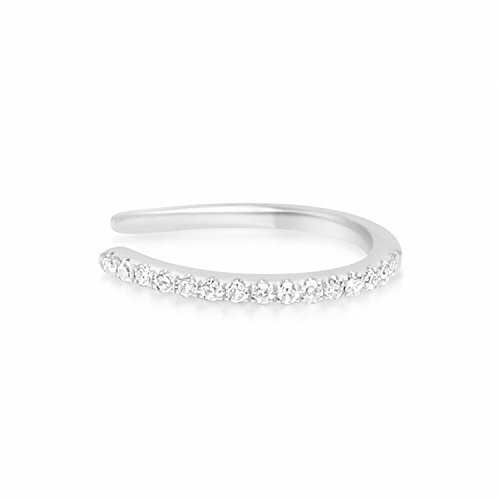 Add this to your fine jewelry collection to wear for years to come, either alone or layer with other ear cuffs or earrings for an edgy, yet elegant look. Stock is Limited, so Don't Hesitate and Buy this Gold and Diamond Ear Cuff Earring Now Before It's Sold Out! SPARKLE & STYLE: Add luxurious sparkle to your look with a Juliette Collection 14K Gold and Diamond Ear Cuff Earring. Combining elegant simplicity with a bit of edginess, this exquisite cuff can be worn alone or nicely layered with additional ear cuffs or traditional earrings. DAZZING DIAMONDS: Round hoop shaped cuff features a single row of 15 round white diamonds totaling .04 carats with G-H color and I1 clarity. MIND OVER METAL: This five-stone ear cuff is available in 14K Rose Gold, 14K White Gold and 14K Yellow Gold designs to choose from. To care for, use a gentle polish to help maintain its shine. NO PIERCE NEEDED: Whether your ears are pierced or not, you can wear this clip on ear cuff in comfort, with the confidence that it will stay secure and in place. MEASUREMENTS: Small single row round hoop ear cuff measures 11 x 2 x 6 mm and weighs .37 grams. If you have any questions about this product by Juliette Collection, contact us by completing and submitting the form below. If you are looking for a specif part number, please include it with your message.